Metal Gear Rising's subtitle of "Lightning Bolt Action" may prove to be misleading, as gamers might have to wait more than a year to play it. Metal Gear Solid character Raiden's story arc is pretty strange. He starts off as an inexperienced and fresh faced Foxhound operative in MGS2, and ends up as a very experienced and metal faced cyborg ninja in MGS4. 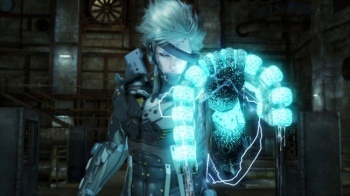 Metal Gear Solid: Rising is set between those two points and shows how cyborg Raiden came to be. Unfortunately, it doesn't look like we'll be finding out any time soon. It was thought that the game would come out next year, but according to Kotaku, the Metal Gear Solid: Rising is skipping 2011 entirely and not coming out until 2012. The site does not specify where this information comes from , however, making it difficult to know whether it's accurate. It's certainly not unusual for gamers to know about a Metal Gear Solid game years before it's released; Konami announced Metal Gear Solid 4 in 2005, but it wasn't released until 2008. The 2011 release date, as much as you can call a year a "date," was always an assumption, so there's no reason that 2012 can't be right. But with that said, it does seem like an awfully long time for a game that supposedly has a simpler story and shorter cutscenes. We've contacted Konami for comment, and will update the story if/when someone comes back to us.